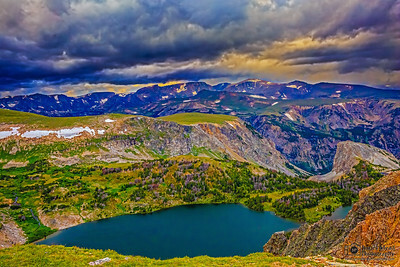 The Beartooth Mountains are a landscape filled with alpine lakes, high plateaus, high mountain peaks. 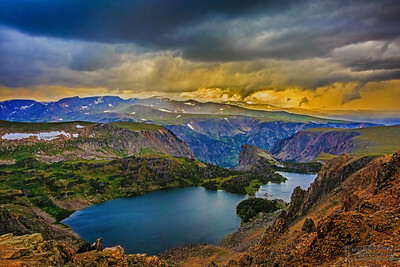 The vast plateaus, alpine lakes, and high peaks of the Beartooth Mountains stretch across the Absaroka-Beartooth Wilderness, three national forests (the Custer, Shoshone and Gallatin National Forests), and two states (Montana and Wyoming). 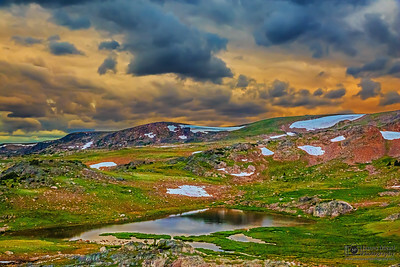 This is Photography of the Beartooth Mountains. 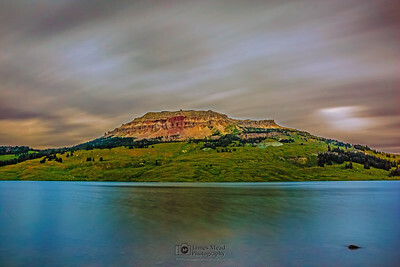 Elevation 10,500 feet: A storm pelts the Beartooth Mountains, Hellroaring Plateau (Montana) and Twin Lakes (Wyoming) with high winds, rain and hail as the thunder rolls. The foreground of the picture is in Wyoming, the background and the Hellroaring plateau are in Montana. 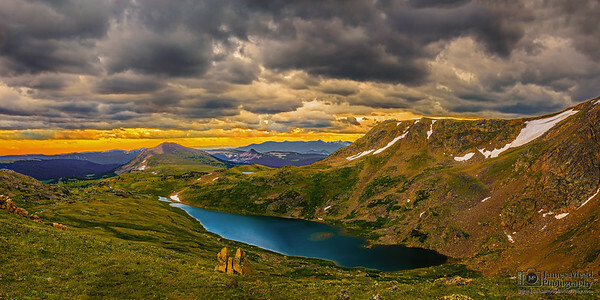 Elevation 10,536 feet: Storm clouds begin to clear over Gardner Lake as Sunset sets in. Alpine Flowers begin to bloom on the Mountain hillside surrounding the lake. 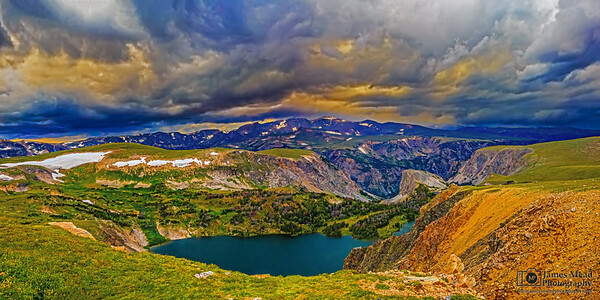 Storm clouds, rain and hail moves from the Hellroaring Plateau towards Twin Lakes high up in the Beartooth Mountains of Montana and Wyoming. 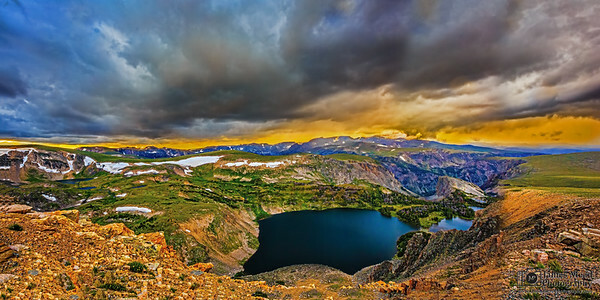 As the summer storm clouds begin to clear, the sun sets over Frozen Lake in the Beartooth Mountains of Wyoming. A sea of Mosquitoes swams the air as twilight sets in. Swams of Mosquitoes are frequent a lot of the time when I'm out shooting at dawn and dusk. 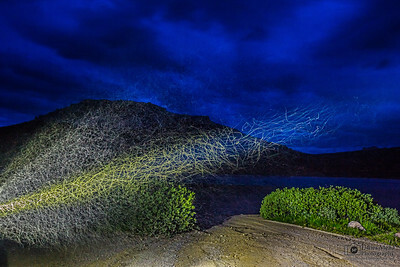 I wanted to capture an image which captures the sense of just how many Mosquitoes swam at dawn and dusk. They're everywhere and they love to bite. Protection against Mosquitoes is a must when out shooting. 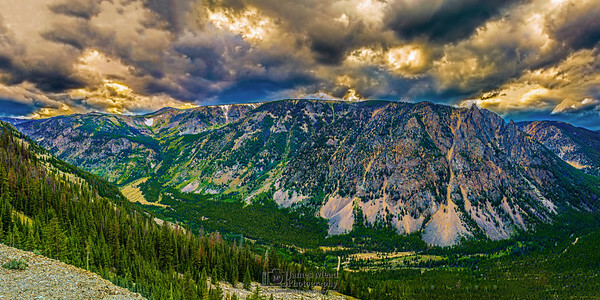 Storm Clouds moves in above Rock Creek Canyon and Hellroaring Plateau in the Beartooth Mountains of Montana. 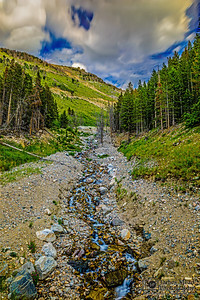 Elevation 10,100 feet: Storm clouds and Thunderheads form over the Line Creek Plateau high up in the Beartooth Mountain Range of Montana. Rain and hail begins to fall over the ridge in the distance as the storm makes its way across the plateau. 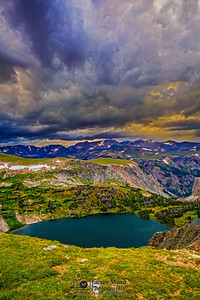 Elevation 10,500 feet: As sunset approaches, a summer storm pelts the Beartooth Mountains and Hellroaring Plateau (Montana) with high winds, rain and hail as it moves towards Twin Lakes and Wyoming. 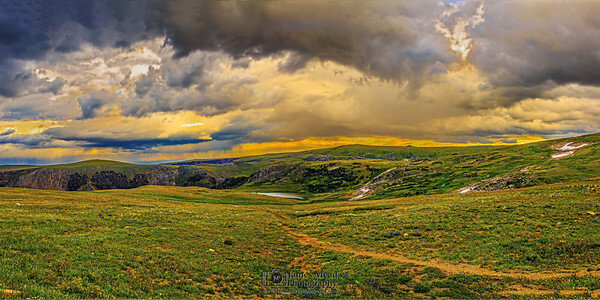 The sun begins to set over the Beartooth Mountains and Hellroaring Plateau as storm clouds move in. Elevation 10,500 feet: This is what Big Sky country is all about. Big skies and fast moving clouds. 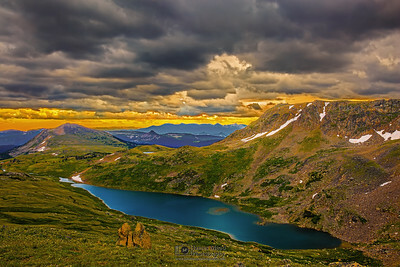 Storm clouds move over the Beartooth Mountains towards Hellroaring Plateau and Twin Lakes as the sunset begins to show behind the trailing edge of the storm clouds. Elevation 10,536 feet: Storm clouds begin to clear over Gardner Lake as the setting sun shines through the lower cloud layer on the Horizon. Alpine Flowers begin to bloom on the Mountain hillside surrounding the lake.